Nicolas Cage, who stars in the highly-anticipated remake of the rapture-inspired "Left Behind," revealed the reasons behind his involvement with the film this week. The 50-year-old actor has starred in films ranging from romantic comedies and dramas to action and science fiction films, including "Ghost Rider" and "City of Angels." While Cage remains tight-lipped about his religious beliefs, the actor revealed that his career closely aligns with his faith. "If you look at my filmography there's no secret to the fact I am drawn to movies that aren't afraid to take on spiritual themes," he told The Christian Post during a telephone conference. "Without going into my own personal spirituality, which is very sacred to me and not for public consumption or meant to be put in the media, I like to let my work speak for me. I like to find movies that allow me to explore these inner or outer worlds through the work without me having to really talk too much about it." Cage added that he is acquainted with the rapture as it is found in the Bible, but the actor is unfamiliar with the rapture-inspired entertainment available today such as HBO's "The Leftovers" or the previous "Left Behind" series starring Kirk Cameron. 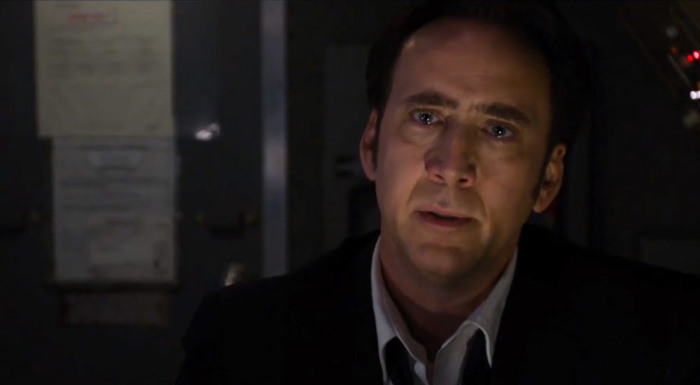 "I am familiar with the rapture of course, but I am not familiar with the "Left Behind' series," Cage told CP. "I am not familiar in any aspect outside of what the Bible says. My brother Mark, a Christian pastor, was excited about the film and encouraged me to make the movie. I got involved because of the script and the opportunity, but saw I also saw how passionate my brother was, and I wanted to make it for him too." Cage stars as Captain Rayford Steele, the captain of a jumbo jet headed to London. Steele is also unhappily married and planning a tryst with a young stewardess when his daughter uncovers his plans. As the flight gets underway, several passengers seemingly disappear into thin air. Gradually, the flight passengers as well as Steele become aware of the reasons why they were left behind. Cage went on to discuss his character at length, revealing relatable qualities of Steele that even he can identify with. "He's an important guy, has a flirtation, he loses track and sight of what's valuable," Cage said of his character. "His love for his family, not that he's a bad guy, but he makes a mistake that many people make when in a powerful position. Many are drawn away or seduced or taken from their true inner values by something attractive or flirtatious or a call of the wild. They lose their place. Many people do it, but Ray Steele gets back to his need for family through the experience. He understands the value of family and just wants to get back on the phone with his daughter and say I love you. I think that is heart-wrenching. And if you have a heart, I don't think it's possible to see the movie and not get a little verklempt. I mean it, there's some very poignant, emotional moments." As for what drew him to the role of Captain Steele, Cage said the powerful message about the redemptive qualities of having a family resonated strongly with him. "I was very taken by the family dynamic that plays out in the script ... that's what drew me to the project, that and the opportunity to work with Vic Armstrong again," the actor said, referring to the film's director. "Captain Steele is a person who is in an extraordinary situation and you realize what his values are. He reaches a catharsis through the experiences of an extraordinary flight he's on, and gets back to the heart, which is his relationship with his family and his daughter. We all make mistakes, but in a moment of crisis, what we want and what we go back to is our families, and that's what pulled me in. Also, how you make such an extraordinary set of circumstances real and make the audience believe the situation. Conveying it to the audience is the challenge. I was always attracted to movies that venture into the unknown, face possibility of extraordinary circumstances." "Left Behind" also stars Lea Thompson, Chad Michael Murray and Nicky Whelan. It hits theaters everywhere on Oct. 3. The book series of the same name has sold over 65 million copies, and it is estimated that one in every eight Americans has read at least one of the books.